Get the goal, slow it down and secure the win. Easy !! And a possible ‘best ever’ shirt. Well that was some weekend. Despite Brentford not being in action due to International weekend, the cause of our lay off has not been without it’s talking points. Alan Judge completed an emotional return to the Republic of Ireland team despite his side going down in Turkey. England fans completed an embarrassing return to Amsterdam despite the team going on to register a win. Over in Gibraltar, Liam Walker of Notts County scored the only goal of the game as the boys from the Rock beat Latvia 1-0, despite never having previously registered a win as a full member of FIFA. Get in you beauties! And could Andreas Bjelland be turning out in the mother of all shirts for Denmark tomorrow night? We can only start with Gibraltar. Despite being 16/1 to beat a Latvia team who sit 75 places above them in the FIFA rankings, a return to the Victoria Stadium across the road from the airport after a two year soujourn in Portgual came with the most wonderful of results. You can’t ask for anything more than a clean sheet, a goal and a win on your return home. And that’s what we got. Liam Walker stepping up after a tense game to hit the most delicious of dead ball winners, Sam Saunders style, with the clock almost at it’s denouement. What a moment. A first victory on home soil. A first victory as a FIFA member. A first clean sheet in, erm, some years. Regular readers to these pages will know of Gibraltar’s goals ‘against’ being the international equivalent of Birmingham City or Leeds United. Fishing the ball out of the net has been a lot easier then putting it in there. A statement that is made with absolutely zero offence intended. A statement made by somebody who has played (badly) at the same stadium that Walker made his mark and who was there as Belgium went beyond brackets late last summer. And now we have a win. This is a moment of huge significance and how appropriate that it is Liam Walker who should get the goal. The record cap holder and, with this strike, heading to the top of the scoring charts. Whilst the Chipolinas and Casciaros of this world are, perhaps, the household names it is Walker who is currently ploughing a lone furrow as Gibraltar’s ‘export’ to the English football league. Plying his trade for a Notts County team very much at the business end of the League Two table. A Notts County team that knocked Brentford out of the FA Cup in the third round and for whom Walker came on to the Griffin Park pitch to shore things up late on when the teams met back in January. We noted then his prowess and now it has been demonstrated in the most visible and global of styles. Get the goal, slow it down and secure the win. Next stop, the Nations League in the autumn. Easy. In theory. I can’t wait. Before that is the World Cup. Whilst Ireland didn’t make it this time, we can’t let the moment of Alan Judge’s return to international football pass without mention. If Gibraltar’s win was of huge national significance, Alan’s own appearance was equally significant – purely for personal reasons. We all know how he was set for Euro 2016 until that horrific assault at Portman Road left him with a double leg break that has taken the best part of two years to recover from. It is a journey that we have all taken alongside him in spirit although one cannot begin to envisage the tremendous psychological and mental fortitude that has been required to get him through what must have been some dark hours. Let alone the physical recovery. The current round of friendlies concludes this Tuesday with Andreas Bjelland, Henrik Dalsgaard and their Denmark team entertaining Chile. Ordinarily, I’d call this as April fool but we’re a few days early. However, it would seem that when they run out against Alexis Sanchez and co, the Danes will be wearing a quite unique shirt. One that celebrates their heritage and has been, apparently, put together by the fans based on classics over the years. I hope this is true. It’s so bad it’s brilliant. Very much the Nicolas Cage of football shirts. Is this for real ? Wow !! From bore draws to Star Wars. Buckets of rain, if not buckets of goals. Brentford 0 Barnsley 0. On paper, not the best result. In practice, equally unsatisfying. Another game where The Bees huffed, puffed but failed to find either a Plan B or a way through a team set up to do a job on us. It started brightly and it ended with the home crowd roaring our boys on in a protracted five additional minutes. It was the 88 minutes in between that felt dreadfully flat. Brentford ‘official’ would later describe the visitors as both “Well drilled“ and “resolute“. The BBC use their match report to call this one “Hard Fought”. That’s diplomatic of them. Personally, I’d have used unimaginative or frustrating. The proverbial bad day at the office with little spark from the midfield, few chances created and Neal Maupay just not getting the run of the ball up front on his own. Funnily enough, last season’s game at home to the same opposition ended with him noting that, ”Our decision-making was poor on the ball”. That one, the occasion of our 4000th league game, saw the Bees go down 0-2 whilst we were also robbed in the half time mascot race. So at least it was an improvement, even if poor decision making remained a consistent theme. If you were there on Saturday then you’ll know that we were off our ‘A’ game. The recent demolition of Fulham nothing more than a wonderful memory. That Barnsley did their homework and that we lacked the wherewithal to bypass their bus. That’s the downside. What one also needs to consider is that it was a game played out in atrocious conditions with biblical torrents of sheet rain falling in the second half. Likewise, this is still another point in the bag. A point acquired over what is sure to be a busy period of games. Norwich City are next up on Friday night and then it’s Aston Villa on Boxing Day. With Josh Clarke going off injured and straight down the tunnel, here’s hoping that was only a precaution. On the flip side, another appearance for Lewis Macleod can only be celebrated. Moreso given the treacherous and slippery conditions underfoot when he entered the field of play. Ultimately, we didn’t lose. Besides, the bigger picture scenario in the Championship is intriguing. The post-match escape to the warming bosom of the pub was greeted with the sight of Birmingham City now sitting bottom of the pile. Forget ten times better, we’re now twelve points better off than our big spending divisional rivals. Even if the architects of their latest demise are a team we should probably gloss over. To be honest, I’m just all a bit ‘meh’ about football today. With the long awaited trip to see the new Star Wars movie finally being enjoyed this morning, that really has been the big draw for yours truly. Unlike yesterday which was somewhat of a bland draw. Still, as somebody bigger and cleverer than me said, “We go again”. Besides, to moan about not losing, in the Championship, seems somewhat trite. It wasn’t a good game. It wasn’t one that we’ll be rushing out to buy the video of. But with the Bees sitting 13th in the table and soon to start an FA Cup campaign with a third round tie at home to league 2 Notts County, the season still has plenty of potential. And that’s before we even mention a certain Emiliano Marcondes…..
Say what you want about Leeds United manager Steve Evans (and many have) but I’d love to know what he did to Toumani Diagouraga. Toums broke the hearts of Brentford fans when he signed for the Elland Road side last week. He was a hero on the pitch and a cult legend off it. Specifically because of his goals. Or lack of. “Toumani scores, we’re on the pitch” went the song. Week after week after week. “Shooooot” went the ground whenever the long legged midfielder picked up the ball anywhere within 40 yards of the opposition goal, such was our desire to see him find the back of the net. 29 March 2013 in a 2-1 home win over Notts County was the last time he’d done it. Since that point Bees fans had to wait almost three years and 111 more games (I’m not including the 8 on loan at Porstmouth) for this most longed for event. Sadly, it wasn’t to be. Toumani has started a new chapter in his career at Leeds United and left Griffin Park with nothing but best wishes from everybody associated with our club. Then yesterday, at around 3.40pm, it all went a bit bonkers. With Brentford having a day off given our lack of involvement in the FA Cup, the normally close-knit Bees family was scattered. Rather than huddled on the terrace and in the stands we were out shopping, drinking, relaxing at home or even at another game. As such, we had to rely on other means to enjoy the moment together and this is where social media came to the fore. If ever a Twitter update brought an unexpected smile to the face it was this one. With Leeds playing at Bolton Wanderers, it seemed Toumani had done the unthinkable and scored a goal. Just 39 minutes into his full debut! That had to be a typo. Surely? But no, my timeline then went into meltdown. Even Harlee Dean got in on the act. Never have I seen such an outpouring of love, affection and all round good vibes directed towards another team’s player. Not to mention a fair share of good-natured banter, too. Toumani scores, and I'm nowhere near a bloody pitch!! Diagouraga's first goal since March 2013, on his full debut. Trolling Brentford with style. @Beesotted just got bolloxed for invading my sons football training as ran on pitch shouting @toums20 has scored !!! All good humour and, I’m sure you’ll agree, nothing but the best wishes towards our former number 20. With Alan Judge reportedly telling sources he’s going nowhere this transfer window, Brentford fans have been left very happy without even playing a game. For now, though, we’ll leave the Last Word to the man of the moment. We’ll crack on with the visit of Norwich City to Brentford shortly but, first, there are a few bits of unfinished business in regards to Monday’s article on the Manchester United – QPR game. Specifically comments around both teams that, quite simply, I ran out of space to include. First up, Christian O’Connell. The Absolute Radio DJ brought United fans back to earth, aswell as highlighting the state of their opponents, with the astute observation on Sunday that, “Celebrating beating QPR is like jumping for joy when you beat Stevie Wonder at Pictionary”. And secondly, to a holier place than even national radio – St. Margaret’s Church. It was there, I am told, that the 10.30 service saw a visiting Priest addressing his congregation thus: “Many thanks to the kind Parishioners who took me to watch Chelsea – Swansea. A great game although being from Uganda I am, of course, a Manchester United fan”. So they’re not all from Surrey, then. And from Uganda to Norwich City. 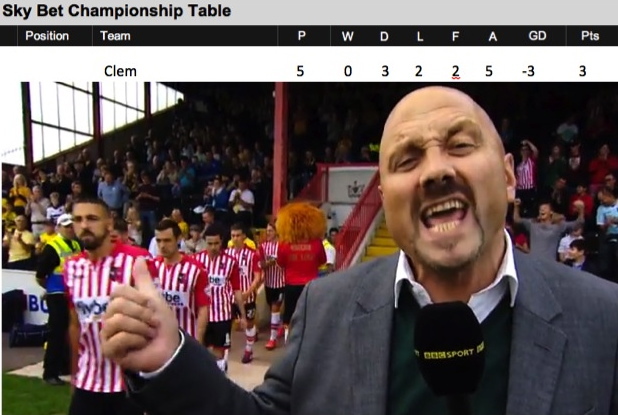 If you want a proper Brentford match preview then (as ever) Beesotted , the BBC or the clubsite are your places. For the Last Word reader, following the feature before the Brighton game, it’s time for the next in our semi-regular series – What were they thinking? The ‘best of the worst’ / quirkier (delete as applicable) of our visitors’ kits through the ages. The best : 1988-89 Scoreline. 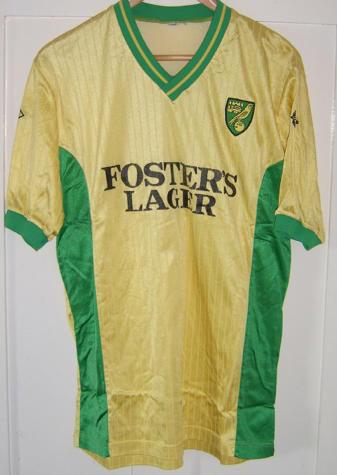 I’ve got personal interest in this one, simply because it is the shirt worn by the Canaries when they reached that season’s FA Cup semi final. Brentford fans won’t need reminding that was the year of Gary Blissett, Manchester City and the quarter final at Anfield where Liverpool did well to eventually edge us out. The unfortunate design : 1989- 1992 Asics. 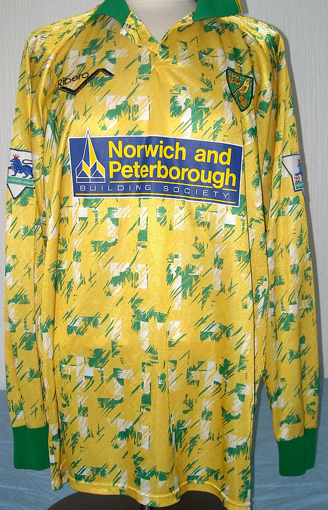 The plus point is that this one sticks to traditional Norwich City colours of yellow and green. The downside is that the green is less ‘trim’ and more emblazoned over the upper body in a way that, especially on the away kit, puts one in mind of a Waitrose delivery van. Were the Norwich City club shop expanding their home delivery service? The worst : 1992- 1994 Ribero. Imagine if your club came up with a great kit design that, after the over indulgence of Asics, got the balance between yellow and green just right. Then, they fed a flock of pigeons nothing but sprouts before allowing them to nest above the final design specs for the team’s latest shirt. This is the result. Pebble dashed by an incontinent pigeon?? Retro classic – the Admiral tracksuit. 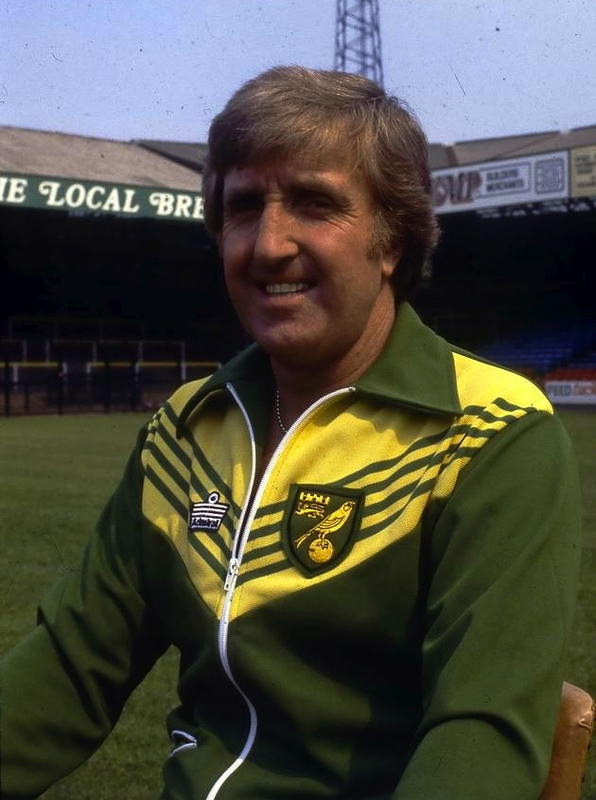 Seen here as sported by Norwich City legend John Bond. If, rather than being a Brentford fan, I’d grown up on the streets of Caistor St. Edmund or Diss in the 1970s I think it’s a fair bet I’d have worn one of these. Probably whilst riding a Raleigh Chopper. Stunning. Brentford fans were able to take it easy on Sunday, basking in the satisfaction of another three points at the weekend (Brighton being the benefactors). With Norwich City next up, a win on Tuesday night will take us above the, currently second placed, Canaries and the returning Lewis Grabban. That’s one to look forward to tomorrow but for now I need to complete the weekend review with the ‘devil and the deep blue sea’ decision that was Manchester United v QPR on Sky. Specifically – two questions. First up, who to cheer for? Manchester United had, prior to this game, actually endured a worse start under Louis van Gaal than they had under David Moyes. As somebody who supports a team traditionally seen as an underdog, there’s always a particular pleasure in seeing the larger clubs come a cropper. And in England they don’t (Manchester City, Liverpool and Arsenal aside) come much bigger than United. Last season’s spectacular fall from grace was a thing of beauty for all of those outside of the Home Counties and Greater Manchester to behold. The traditional United fanbase stunned by their team’s unprecedented self-destruction as even Europa League qualification evaded them. So when things continued in the same vein this campaign, I won’t pretend I wasn’t pleased to see more of this. 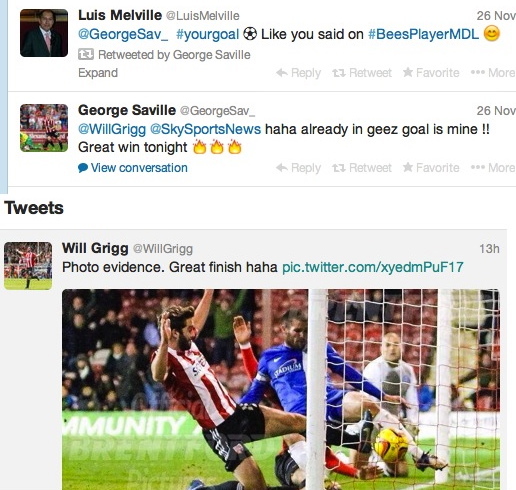 Cripes – even Will Grigg managed to rediscover his prolific shooting boots against the Red Devils. But then Louis went shopping and normal service looks like it has been resumed – well, it was fun whilst it lasted. But if we didn’t cheer for United then the alternative was the Loftus Road mob. I can’t imagine any circumstance where I’d willfully hope they won. No offence to any QPR fans who may read but, like Fulham, a victory over our West London neighbours is always one to savour. Any sign of our geographical rivals tripping up is a moment to appreciate how good life can be. So in the end, it was one of those where you just sat back to see what the footballing gods throw at you. With United meting out a 4-0 thrashing that, at one point, looked like it was heading towards those fabulous brackets that come with 7(seven), it’s fair to say that this Brentford fan was left happy with the outcome. Second question. United play in red shirts, white shorts and black socks. QPR play in (predominantly) blue and white shirts, white shorts and white socks. In theory, this shouldn’t have presented any kit clash beyond, perhaps, a switch to blue shorts. So why, short of some Fergiesque excuse about being unable to see each other against the crowd, did the visitors need to don their third kit? Moreso as it is almost identical to the home version. Socks and shorts are both white but the shirt simply drops the blue. It seemed a totally unnecessary exercise in justifying a superfluous third kit. One for the marketing men to answer. Still, if they carry on with results like this then there may be a rather hefty fine to pay. Going to need to shift more than a few extra shirts to cover that one. Interestingly, Brighton’s blue and white didn’t seem to present any problems against our red and white in the weekend game. With the club now posting their YouTube highlights, you can savour that fine win once more (and see how two teams cope with a non-existent kit clash). 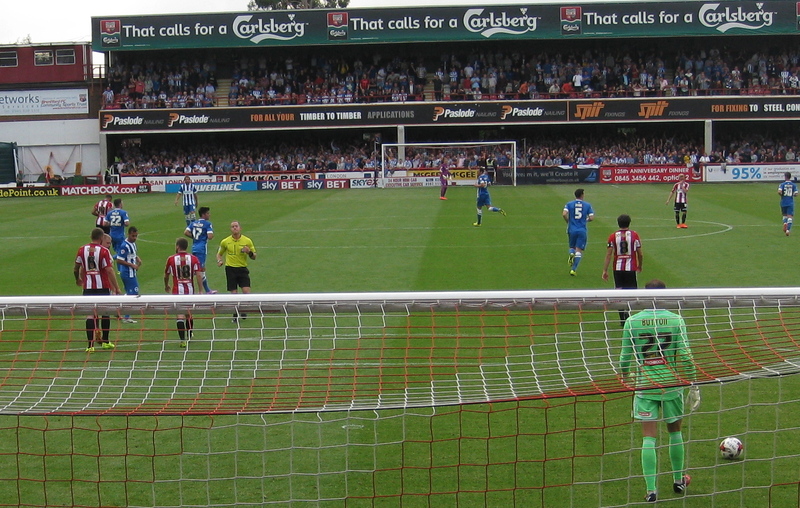 Brentford sailed into the Championship play off zone after a thrilling 3-2 win over Brighton. In a performance considered by most to be our best since going up, the Seagulls had to be content with scraps as the trawler marked ‘S.S. Brentford’ left Brighton floundering in her wake.